When you live in Dunedin, you’re in a thriving small city with an abundance of things to see and do. Our beautiful beaches along the spectacular coastline are favourites of swimmers, surfers and those that just love walking on the uncrowded, unspoiled sands, breathing in the freshest air imaginable. Our café and restaurants are great places to pass the time and catch up with friends, or to rest your feet between visits to our superb museums, galleries and of course the Botanic and Chinese gardens. Dunedin is an amazing city for sports, with many Olympians, international cricket, golf and rugby players having benefitted from the facilities on offer in our city. From championship golf courses to an Olympic standard swimming pool, right through to the all weather Forsyth Barr stadium, Dunedin is a great city for sport. 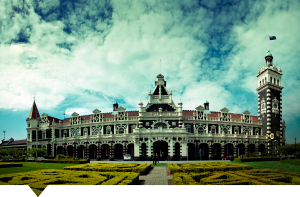 For architecture and wildlife lovers, Dunedin offers the stunning Larnach Castle and the standout Victorian and Edwardian buildings such as First Church and Dunedin Railway Station. Along the Otago Peninsula, visit the wonderful Royal Albatross Centre, and see fur seals, sea lions and yellow-eyed penguins in their natural habitat. Just 20km north of Dunedin lies the award winning Orokonui Ecosanctuary with its varied species of native forest and wildlife. Visit www.dunedinnz.com to find out much more about living and working in Dunedin, what to see and do, annual events, where to stay, where to eat, nightlife, shopping and cultural attractions.